French-owned CroisiEurope launched MS Cyrano de Bergerac in Bordeaux in May 2013. The ship is dedicated to cruising the Gironde estuary out of Bordeaux, sailing the Garonne and the Dordogne rivers, principally to visit the great wine-growing areas of the Medoc on itineraries ranging from four to eight nights. The vessel is a significant step up from the line's older ships, with clean, fresh green-and-white livery; bright, cheerful decor; and light-filled interiors. Its older sister, Princesse d'Aquitaine, which sails the same route, is significantly darker and more dated inside. CroisiEurope rates Cyrano de Bergerac "four star premium," but ratings for river cruise lines are largely meaningless, as there is no official grading system. What's clear when sailing on this ship is the exceptional value it offers when compared to more upscale and inclusive ships. Other lines' riverboats might have more plush interiors, much bigger cabins, balconies and, on some vessels, extras like a small spa, a pool or an alternative dining restaurant. 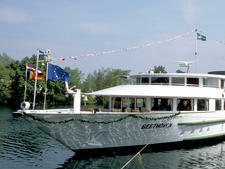 Gratuities, excursions and premium drinks are usually included, which they're not on this vessel. Cyrano de Bergerac is much more basic in decor than, say, a Viking or an Avalon river ship, but it's still perfectly pleasant, despite its small and simple cabins. The food is great, and complimentary wine, beer and soft drinks are available all day long. So if you're not bothered about little refinements of service or a bigger choice at mealtimes -- and if you prefer to pick and choose excursions rather than take part in everything -- Cyrano de Bergerac represents superb value for money in a comfortable and friendly setting. In reality, it's about one-third of the price of a slightly fancier ship. Fellow passengers are mainly French, but there's a growing international clientele as the company tries to attract cruisers from Britain, Australia and North America. This cruising area attracts mainly couples and wine enthusiasts; it's less of a family destination. Crewmembers all speak English, and announcements, menus and the daily program are published in French and English. Dress code is smart casual throughout, and there are no formal nights, although passengers are encouraged to dress more smartly for the once-per-cruise gala night. Most of the passengers are French, so there's an element of chic onboard. French cruisers do not, for example, wear shorts for dinner. As with all river cruises, good walking shoes are recommended, as there's plenty of walking during the shore excursion program. The ship moors right in the heart of Bordeaux, too, which is a very walkable city. The onboard currency is the euro. Gratuities are not included in the price. The recommended amount is €10 per person, per day, but there's no pressure to tip; France does not have a particularly strong tipping culture.